I wait all year for the Christmas season to arrive. All. Year. Long. In fact, I kind of get a little bit sad when it’s all over. I love the planning, the cooking, the family – really all of it. To be honest, I don’t much enjoy the “cleaning the whole house” part, but other than that – I’m a holiday girl through and through. I think the holiday season is so special to me because our mom made it so special for us growing up. Christmas was a big deal – and not just the day, but the entire season. Our tree was always adorned with ornaments we made as kids, and together with our mom. Dad made sure the manger was out (without baby Jesus until Christmas morning, of course), the house was decorated, and it smelled amazing. Always. There were always Christmas cookies, bread, and hot chocolate on demand. All with those little marshmallows. Growing up I loved those little marshmallows that came in the hot cocoa packet. I’ve just kicked it up a notch. Being a girl who embraces the season as much as I do, I want to be sure that I make it just as special for my little one. We have as much of the family over as possible (along with anyone else would would like to join us), decorations go up the day after Thanksgiving, our manger is out (minus baby Jesus – for now), and the house is filled with music, Christmas specials on television, holiday cooking, and LOTS of hot chocolate! A hot cocoa bar seems like a new idea, but it is one I’ve had in my home since the first year my son was born. 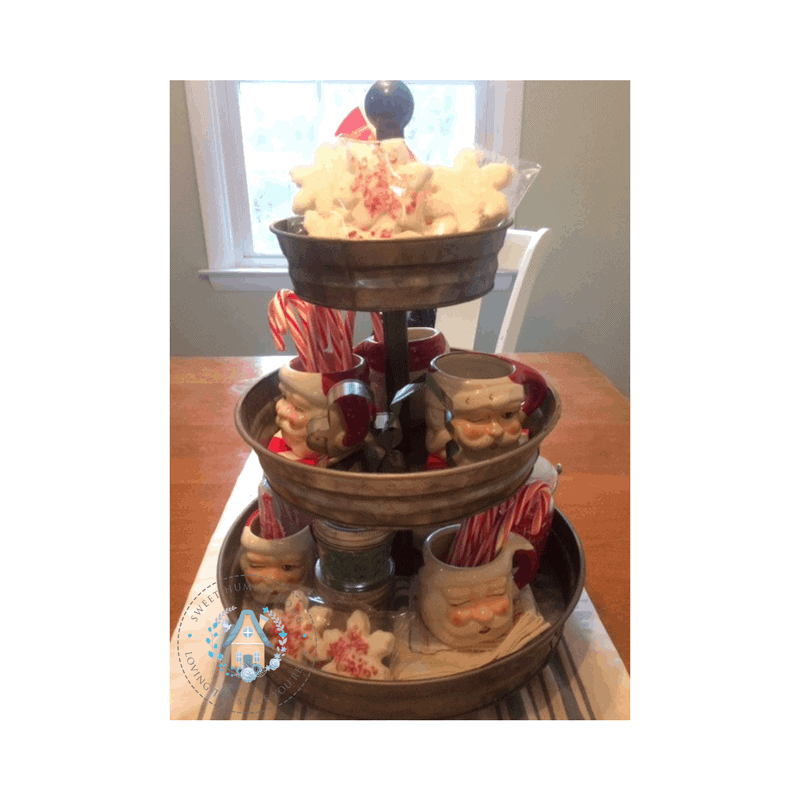 It started out on a cake stand, and it has developed into a three tiered, stuffed full of sugary treats tradition that he looks forward to every year. Creating your own is SO simple. You don’t need a fancy, three tiered tray (although the one pictured here is from Hobby Lobby). You can use a cake stand or a couple stacked, a section of counter, a couple of empty gift boxes at different heights, some mason jars or cute containers, and a whole mess of festive hot chocolate adornments! The secret is to make it fun! I gather different types of sprinkles, cookie crystals, candy, fancy marshmallows, cinnamon sticks, and candy canes. LOTS of candy canes. I’m a true believer in needing a new candy cane for each cup of cocoa! (Even on a school night)! There isn’t anything better than starting a fire, turning on Rudolf, and cuddling up with a cup of cocoa! Putting the cocoa in a fun mug feels even more festive. 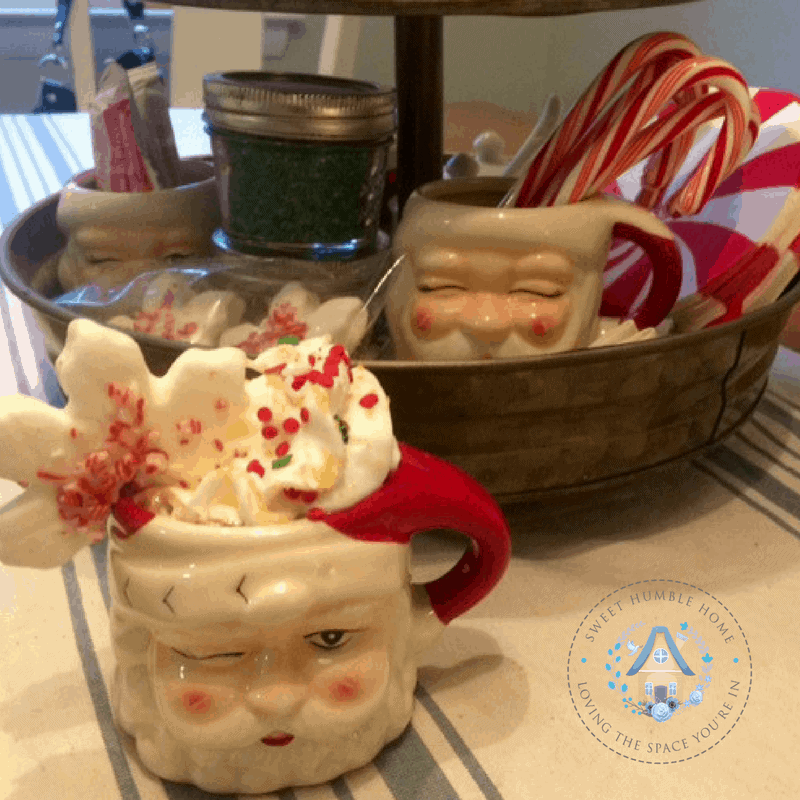 I purchased these beautiful Santa mugs at Pottery Barn, and I look forward to taking them out every year! They have a set of Santa shot mugs out now – so cute! 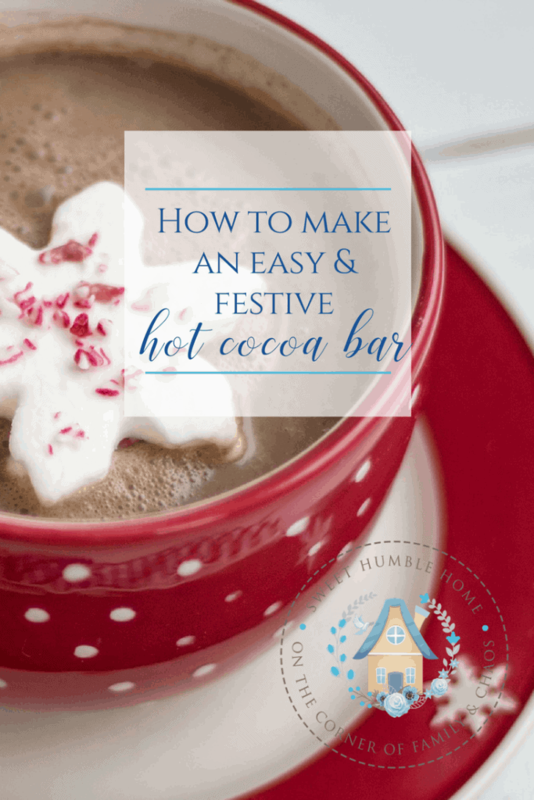 Remember – your hot cocoa bar can last past the holidays! Change out your mugs and keep it through the winter! If you have one – I’d love to see a photo of yours! That is so creative and inviting. Special traditions such as these definitely create special memories that last a lifetime. Thank you! Creating memories is so important! I’d love to hear about some of your favorite holiday memories!